↑ Concordia Triglotta, Historical Introduction, St. Louis, MO: Concordia Publishing House, 1921, p. 13. ↑ J.N.D. 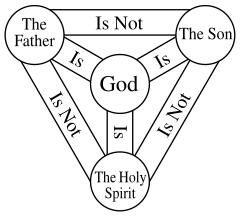 Kelly, The Athanasian Creed, NY: Harper and Row, 1964. ↑ Celia Chazelle (October 1997). "Archbishops Ebo and Hincmar of Reims and the Utrecht Psalter". Speculum 72 (4): 1056. This page was last changed on 5 June 2018, at 04:44.